It was a good day filled with luck for me. It all started with me attending a meeting about Outlander and the business opportunities it can provide local businesses. 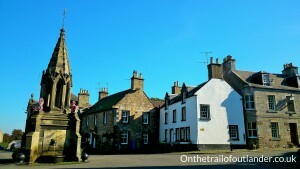 Then off we went on to a coach to visit 2 sites where Outlander had been filmed locally. 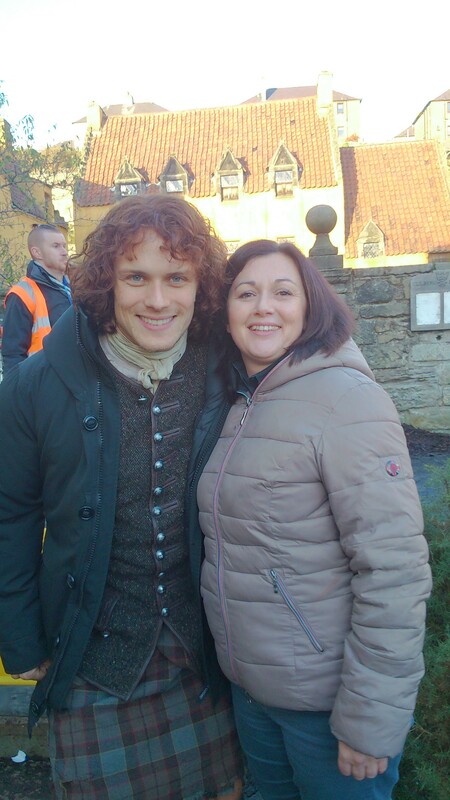 The first site we were to visit happened to have Outlander filming taking place. So the coach made a slow drive by and we all flocked over to one side of the coach with our cameras and took as many photos as we could. While on the coach we glimpsed the back of Sam Heughan’s head! He was here on set! After the visit to the second Outlander site and a short meeting. I got in my car and raced back to the film set. I walked down a narrow alley to emerge in the thick of things film props, and cables were everywhere. Realising I was in a place I probably wasn’t supposed to be I decided to try and look lost and inconspicuous. While doing this by looking around as if I was trying to work out how to get off the set area, I didn’t realise Cait (Claire) walked right passed me. Then I unknowingly began to walk behind following her. She was wrapped up in a thick coat and waterproof trousers, not in costume so I guess she wasn’t needed for filming that day. So I gathered across from the gap in the wall where the filming was going on inside and with a small group of fans waited. Who told me I had just walked behind Claire and wished that I had tripped her up a bit to get her attention! We laughed. Then Graham McTavish (Dougal) walked out and by the time I got my phone out and got it on to camera mode, he had gone. I was disappointed to say the least. I didn’t have to wait too long after that, about 20 minutes, then Sam Heughan came out in his full Highland wear from filming. 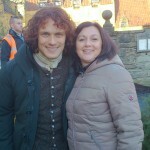 One of the other fans asked Sam for a photo and we all jumped in and asked for one too. He is a verra tall man Sam and I am only 5’4″ so when it came to my turn I said I might have to stand on a step to reach him. Instead he bent down to my level for the photo to be taken and put his arm around me. Now I know I am 43 years old but after that I felt like a silly school girl, all giggly and shaken, all a quiver. Sam was very polite, pleasant and was very obliging to those of us there. Thank you Sam for stopping and making a good day a great one. Look forward to season 2 next year. 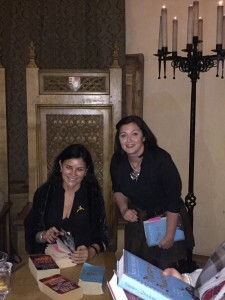 On 23rd November 2016 Diana Gabaldon and Neil Oliver were at Stirling Castle. They were there as part of Scottish Book Week. It was an interview chat about their novels. I was one of the lucky 200 to obtain a ticket. 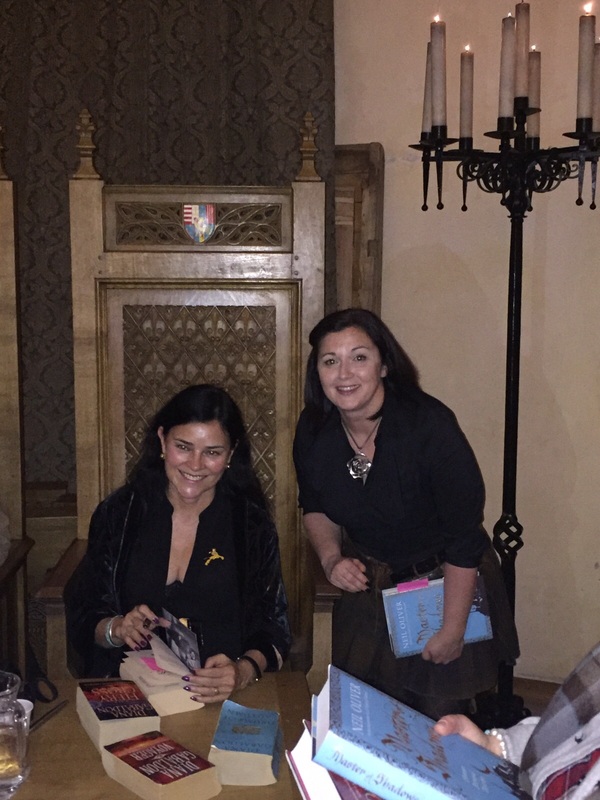 I primarily went to meet Diana Gabaldon but local archaeologist and TV presenter Neil Oliver was a big bonus for me. They were interviewed at the same time and it was fascinating as they discussed how they both write; 2 totally different methods. Neil Oliver had an end line and then started to work towards the ending; while Diana thought of an object and the scene grew from that, Each scene might not make sense to her but the scene was banked and she said eventually she had scenes to make a book. Then both stayed for book signing. 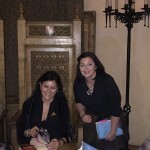 I again was lucky enough to get 4 books signed, yes 4! Well……and as I said to Diana…..I might not meet you again so I am going to make the most of this opportunity. She smiled and said no problem. I mentioned a mutual acquaintance, a lady who had been on my tour years ago, and Diana acknowledged her. She was a very nice, pleasant lady and I hope to meet her again. If I was able to have asked the two authors a question it would have been……what is your favourite malt whisky and how do you drink it? I hope one day to get an answer to this question. 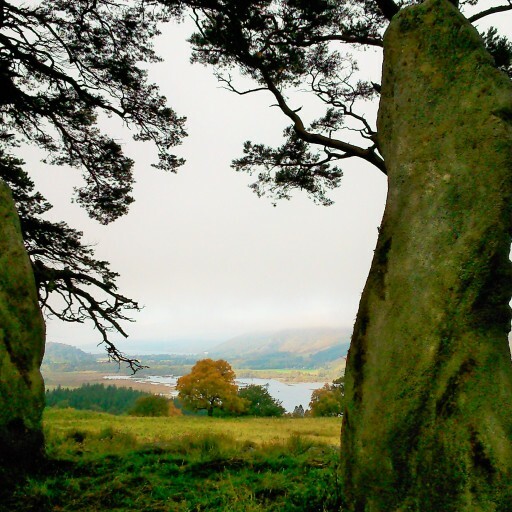 This 7-Day/6 night tour takes you throughout Scotland visiting locations used in filming the hit TV series Outlander. Sept 24 – Head east of Edinburgh to Preston Mill which became Lallybroch’s Mill. Travel on to Prestonpans. Next go to Glencourse Kirk (if permission is granted) before returning to Edinburgh. 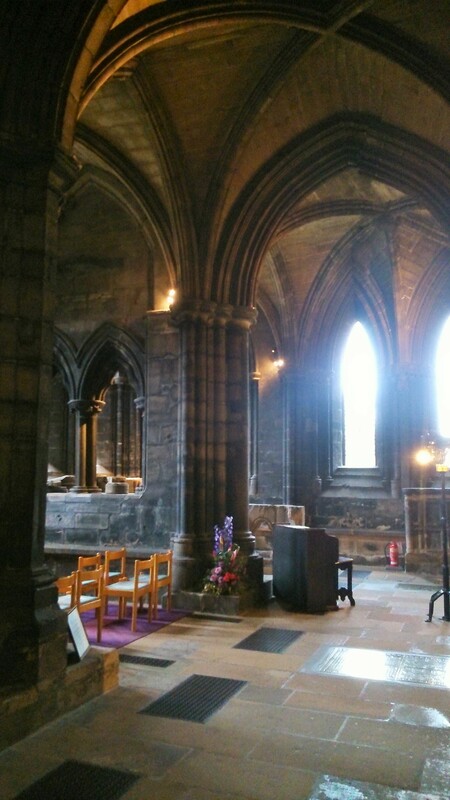 In Edinburgh visit the Palace of Holyroodhouse before an Outlander walking tour of Royal Mile. Sept 25- Today you cross the River Forth to explore Fife’s Outlander locations. Aberdour Castle that stood in for Abbey St Anne de Beaupre; Dysart harbour, used as Le Havre port; Balgonie Castle that became MacRannoch’s place; Falkland that became 1943 Inverness; and Culross aka Cranesmuir. Sept 26- Travelling north today explore Linlithgow Palace; Blackness Castle; a local railway station used in Season 1 and Callendar House. Lastly we stop at Doune Castle or should I say Castle Leoch. Sept 27- Heading north stop at Tullibardine Church then Tibbermore Church. Then go off the beaten track in search of Craig na Dun soaking in the beautiful Highland scenery. Travel deeper into the Highlands as you carry on north stopping at Newtonmore to visit the Museum of Highland Life where various scenes from Season 1 were filmed. 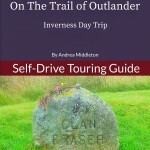 Sept 28- Today we explore around Inverness, first stop is Culloden. Walk out on to the battlefield and be a part of the commemorations of the anniversary of the battle. Then on to the prehistoric Clava Cairns, one of the stones here has a cleft in it. Passing Culloden House we head in to clan Mackenzie and Fraser country. Stop to see Castle Leod, visit a local distillery, Beauly Priory and Wardlaw Mausoleum. Sept 29- Travelling through the Great Glen we see Loch Ness and stop at Urquhart Castle; learn about Highland dress and weaponry before visiting Glenfinnan, where Bonnie Prince Charlie raised his standard in Scotland to start the ’45 Jacobite rising. Sept 30- Head south to Glasgow. Travel through Glencoe and walk in the magical Finnich Glen. Then in to Glasgow. Here we stop to visit Pollock Park where various scenes were filmed; Glasgow Cathedral where filming took place for Season 2, Lastly stop at George Square to see the doorway Claire and Frank run in to to get married. Take yourself on a trip from/to Edinburgh as if you have your own personal tour guide with you, explore some of the places used for filming the Outlander TV series. As well as discovering which scenes were filmed at these locations, also learn a bit the history of them. This ebook will get you to the locations of Lallybroch, Wentworth Prison, Fort William, 1943 railway and Cranesmuir. Directions are also given to keep you on the right track. All you have to do now is set off and explore.